Ground steel ram with adjustable gibs for precise stamping. Multicolor heat transfer index unit with photoelectric eye registration. Dwell time adjustable 0 to 99.9 seconds. Air filter and dual air pressure regulators. Top quality components are utilized throughout the manufacturing of Hastings products. Electrical – mechanical and pneumatic components are always standard off-the-shelf components that are readily available. All machined components are painted – zinc plated or hard anodized for lasting protection. 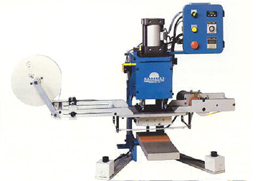 Economical frame design allows this bench top press to be utilized in industries where small reel to reel heat transfers are applied to sock liners – textiles and vinyl when low pressure is required. Heat transfer index system utilizes a photoelectric eye sensor to register heat transfers with witness marks on the front or back of the carrier paper.